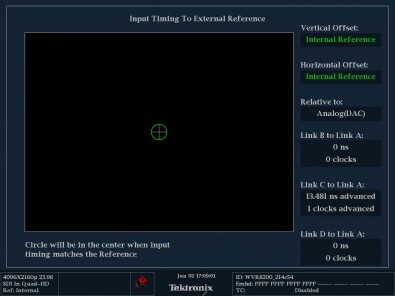 Tektronix WVR8200 Waveform Rasterizer showing a 4K measurement. As broadcast standards and technologies move forward, consumer expectations – especially those of early adopters – are extremely high. 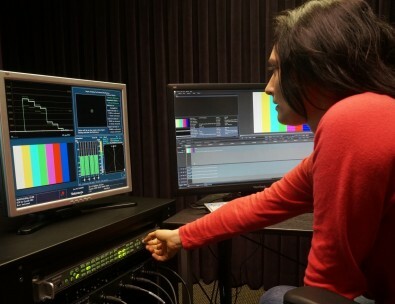 QC of 4K/UHD content is a critical step toward meeting those expectations. Meeting these high expectations was first and foremost in the minds of 3rd I staff when it came time to set up new QC rooms capable of handling 4K/UHD content. One option that was never considered was to take the 4K output, down-res it to HD, and then run it through an HD rasterizer since our customers expect us to look at their actual content not a facsimile. For us it was a matter of reaching out to the best in the business, the people who our operators swear by, the ones our guys are the most comfortable with and asking: Do you have a 4K unit and when will it be available? 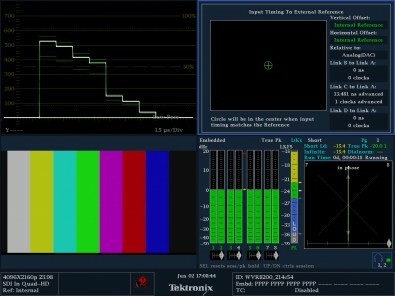 As it turned out, Tektronix in fact was hard at work adding 4K support to its family of waveform monitors and rasterizers. We were probably one of the first QC houses to get the WVR8200 with 4K support and almost certainly the first to have multiple units. Given the long-term success we’ve had with Tektronix QC equipment, there was never a question that we would go with Tektronix rasterizers for our 4K rooms. The Tektronix WVR8200 rasterizer in action at 3rd i QC offices in Culver City, CA. As you might expect, the installation process was straightforward. The main difference from installing any other rasterizer was the need to connect four 3G SDI cables instead of one or two. The unit sits in our signal path after the playback device and before the display. We’ve never encountered any display or connections issues that were generated by the Tektronix system. And since the instrument is rack mounted, there really isn’t much more to say about the installation. On the training side, our real-time QC specialists have extensive experience with Tektronix rasterizers so there was essentially no learning curve or special training needed. 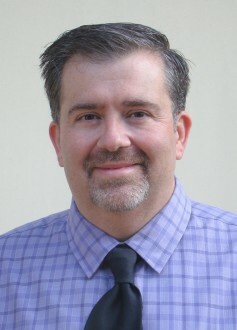 That said, Tektronix has a reputation as being the gold standard for QC solutions, and in our experience that reputation extends to their support as well. As opposed to some of the cheaper solutions, we know that the support from Tektronix will be impeccable. In addition to providing responsive support on an as-needed basis, Tektronix offers “insight seminars” every few months that we find are very valuable. One of the new features in the WVR8200 is a timing display that enables 4K inter-link timing measurements. This helps our system engineers maintain correct timing across quad-link SDI signals, and is useful when evaluating new 4K gear to see how tight the sync is on the different signals. The timing display makes this easy through a simple graphical representation, which shows the relative timing of the input signal and the reference signal (or a saved offset reference) on an X-Y axis. The WVR8200 is useful for 4K inter-link timing measurements. The Tektronix WFM8200 and WFM8300 waveform monitors and WVR8200 and WVR8300 rasterizers can now be easily upgraded via software to support 4K, eliminating the need to purchase costly hardware replacements in order to shoot, prepare and deliver 4K programming. We are planning on doubling our number of 4K/UHD rooms by the end of the year. One thing that won’t be changing is the WVR8200. 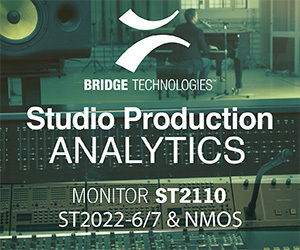 We may have different playback equipment in the rooms in case there are problems, but the measurement tool will stay the same.The reason is that we trust the results on it -- regardless of the playback machinery we know we can trust the WVR8200 to provide consistent, accurate and repeatable results. This repeatability plays out in other ways. For instance, we recently completed a test for a client to evaluate different encoding schemes. In a case like this, we’re trying to bring objective consistency to our analysis and reporting. Having a measurement tool that is completely consistent regardless of the format or the playback device makes our jobs a lot easier and saves us time. Another important aspect of the unit is its ability to switch modes seamlessly. Particularly during the transition to 4K, we get content that is in full 4K (4096 x 2160) as well as UHD (3840 x 2160), among others. Since we deal with many different formats and modes on a daily basis, this flexibility ensures we see maximum return from our equipment. Moving to 4K/UHD is an important step for all of us in the broadcast and entertainment industries. With this transition, QC takes on new significance. For anyone who believes as we do that QC should be performed on actual 4K/UHD video content -- without down-resing it to HD – then the Tektronix WVR8200 rasterizer is an excellent option and highly recommended as a core element of your QC program. The solution works well for us at 3rd i.
Ramón Bretón is chief technology officer for 3rd i QC, a pioneering company in the field of quality assurance for the home entertainment industry.